An international effort to protect the diverse plants and animals of Tonga’s small islands is proving to be a success. The joint project, to remove invasive ship rats (Rattus rattus) from Malinoa and Motutapu islands, was spearheaded and launched in August 2015 by the Government of Tonga, the Secretariat of the Pacific Regional Environment Programme (SPREP), and Island Conservation. Together, the groups organized a ‘learning-by-doing’ workshop and demonstration project to remove invasive predators from the islands in order to protect rare native plants and animals and at the same time help countries with small islands develop the skills to complete small, simple eradications with little assistance from outside organisations. Invasive vertebrates such as rats are a major threat to the biodiversity of the Pacific. This conservation intervention developed skill sets and experience that can help turn the tide against species facing extinction in the region. We are delighted with this result and very pleased to see the motivation within Tonga and other Pacific islands to restore more islands. On tropical islands, like those in Tonga, invasive rats eat virtually everything disrupting the existing ecological balance. Removing invasive rats benefits seabirds which provide an important source of nutrients for the islands. These nutrients literally feed the forests that serve as a home for other native plants and animals. Invasive rats disrupt resilient island ecosystems, including near-shore environment, that provide important marine environment benefits such as increased phytoplankton and related increases in marine resources for local use. Recent surveys and monitoring on Malinoa and Motutapu confirmed that rat eradication was successful. The islands were assessed by completing day and night surveys for rats and rat sign, and by checking rat traps set overnight. The team noted changes in the islands’ native plants and animals offering hope for dramatic island restoration responses. The team observed increases in the abundance of birds such as the Wattled Honeyeater, also known as the Fuleheu (Foulehaio carunuculata), and Polynesian Starlings, also known as Misi or (Aplonis tabuensis). They also noted that Black-naped Terns (Sterna sumatrana) were nesting with eggs intact on both islands. It is important that Pacific countries have the capacity to manage invasive species. This project is aimed at facilitating countries to succeed in meeting meaningful conservation goals, eventually on their own accord in bite size chunks. This will complement more complex projects and conservation goals which require more extensive resources, technical assistance and finance. Humans have introduced non-native, invasive mammals (accidentally or intentionally) to ninety percent (90%) of the world’s island archipelagos, which poses a unique biodiversity conservation challenge and opportunity. Islands occupy less than six percent (~5.5%) of the Earth’s land area, yet are home to fifteen percent (15%) of terrestrial species. Islands have suffered sixty-one percent (61%) of recorded extinctions with invasive species implicated in the majority of those. Thirty seven percent (37%) of all Critically Endangered species on the IUCN Red List are found on islands. 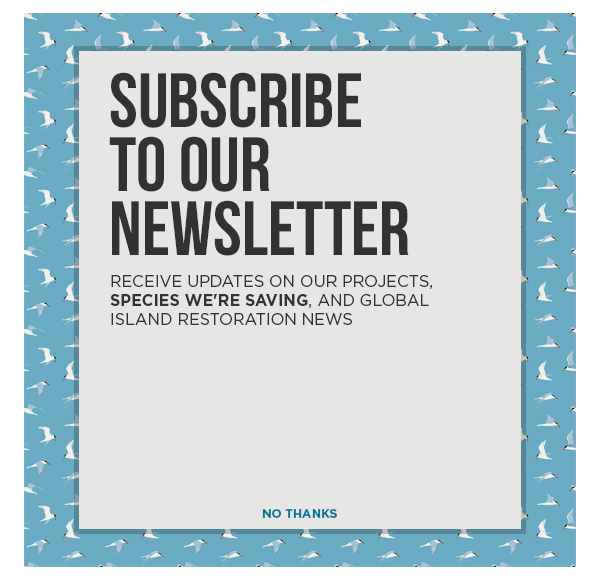 Rodents have been successfully removed from over 500 islands world-wide and a recent study concluded that continued investment in invasive mammal eradications on islands offers a highly effective opportunity to stem the loss of our world’s biodiversity. This promising new initiative adds Tonga to that global, island restoration movement. These islands were established as priorities for protection during the Vava’u BIORAP, or Biodiversity Rapid Assessment, completed by SPREP and the Tongan Government under the Global Environment Facility’s – Pacific Alliance for Sustainability (GEFPAS) Integrated Island Biodiversity Project. The initiative is supported by: the Global Environment Facility Pacific Alliance for Sustainability (GEFPAS) project ‘‘Prevention, control and management of invasive alien species in the Pacific islands”; the United Nations Environment Program (UNEP); the Secretariat of the Pacific Regional Environment Programme (SPREP); the Tongan Ministry of Environment, Energy, Climate Change, Disaster Management, Meteorology Information and Communications; Island Conservation; Vava’u Environmental Protection Association (VEPA), Fonds Pacifique, and Bell Laboratories. The Secretariat of the Pacific Regional Environment Programme (SPREP) is the primary intergovernmental environmental organisation in the Pacific. SPREP’s work is guided by the SPREP Strategic Plan which has been developed by the 26 SPREP member countries and territories. The Secretariat, based in Apia, Samoa, works with members and partners to deliver on environmental management and sustainable development in the region against four strategic priorities: Biodiversity and ecosystem management; Climate change; Waste management and pollution control; and Environmental monitoring and governance. SPREP delivers its strategic priorities through policy and technical support to island members, providing provide direct national level support while building technical capacity and relevant common approaches through regional collaborative efforts. The Kingdom of Tonga, is a Polynesian sovereign state and archipelago comprising 169 islands of which 36 are inhabited. The total surface area is about 750 square kilometers (290 square miles) scattered over 700,000 square kilometers (270,000 square miles) of the southern Pacific Ocean. It has a population of approximately 103,000 people of whom 70% reside on the main island of Tongatapu. The Department of Environment is the national focal point for conservation of biological diversity, sustainable use, and management of the natural environment, addressing emerging environmental issues.